Let’s go Back to the Future! Wait, that’s today? Will We Ever Need It Again? 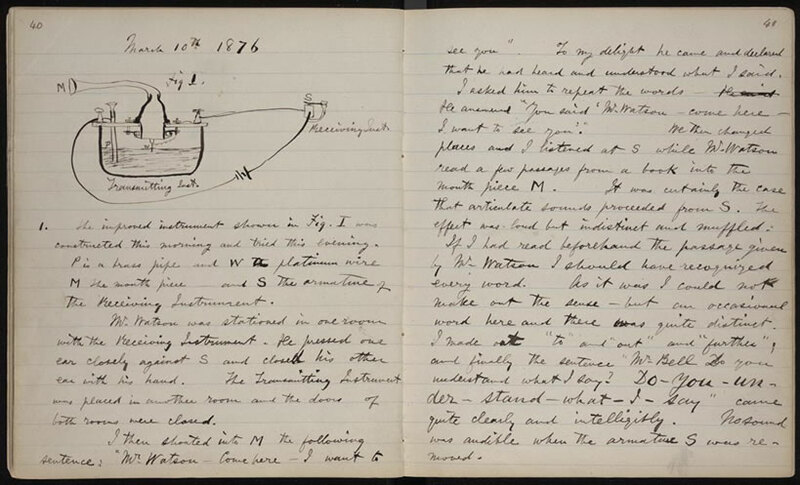 On this day March 10, 1876, Alexander Graham Bell is credited with the first successful experiment involving the telephone. 107 years later, the cellular telephone would emerge on the market, this time invented by a man named Martin Cooper. Cooper conceived the first portable cellular telephone in 1973 then led the 10 year process of bringing it to market by 1983. 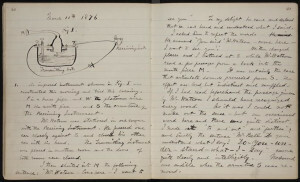 Alexander Graham Bell’s handwritten notebook entry describing this event on March 10, 1876 – Photo from American Treasures of the Library of Congress. It’s likely, most (of us) don’t remember life prior to the telephone and couldn’t imagine life without the lines of communication open and available. Not being able to pick up a phone and talk to friends and family – when face to face or writing a letter just wouldn’t do? Oh my. Who knew – that one day, even the wild west would meet technology. In case you’ve been hiding in the lab the past few months, you should know: Shark Week is finally here! Originally aired by Discovery in 1987, Shark Week was designed to raise awareness and respect for one of the ocean’s most important – if not terrifying – creatures. Now in its 26th year, Shark Week can claim the title as the longest running television event in history. 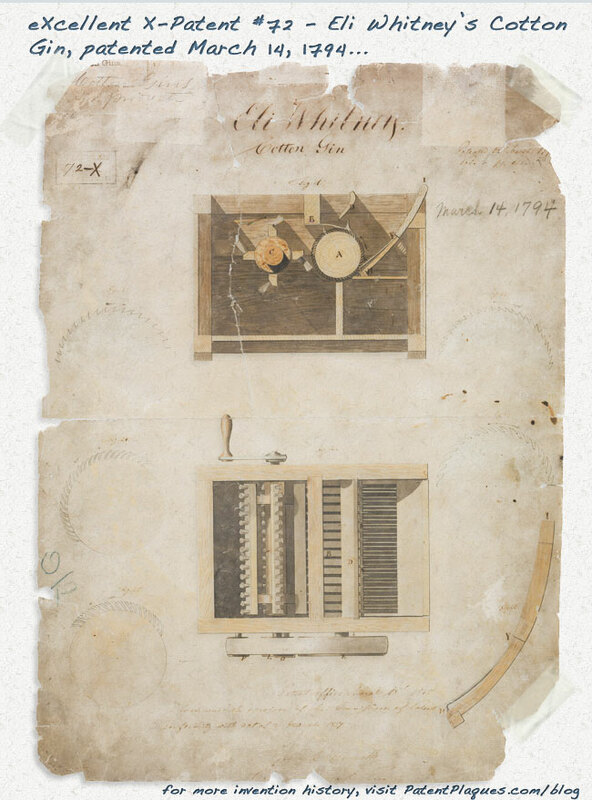 On March 14, 1794, Yankee-born Georgia inventor Eli Whitney received the 72nd patent ever granted by the United States for his game-changing cotton gin. It’s a strange thing, the cotton gin – as much as it did good being the catalyst that helped industrialize the South, it did bad by contributing to the growth of slavery, and, ultimately, the start of the Civil War. Never mind the fact that its story is also an excellent case study of patent licensing & infringement proceedings in a fledgling patent system. 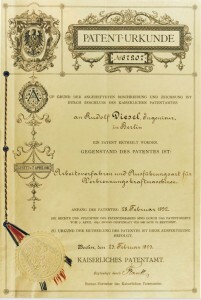 Which came first: Patent #1 or the First Patent? 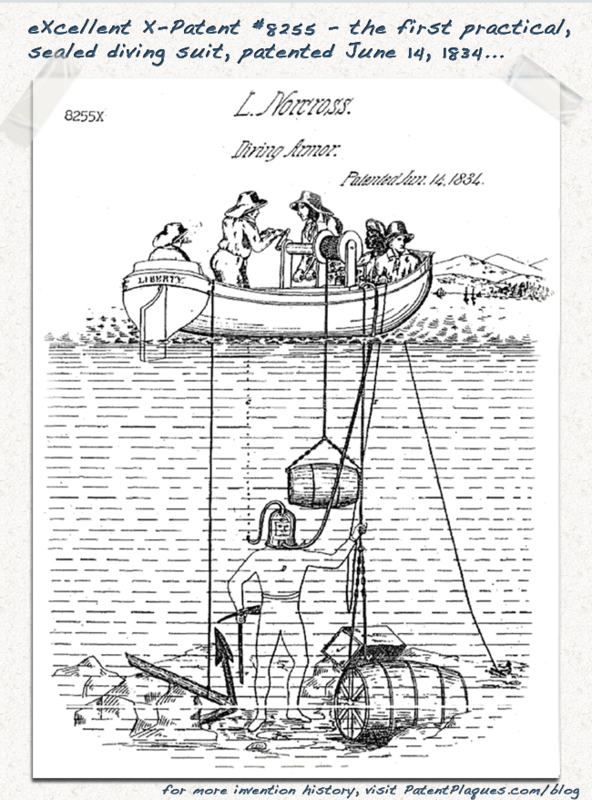 On June 14, 1834, Maine inventor Leonard Norcross patents what is widely accepted as the first practical, sealed dive suit. It featured weighted feet and a hard, water-tight helmet. Exhaust air was pushed out the top of the helmet, which finally allowed divers a full range of motion underwater. This week in Invention History, we mark two important events in the development of the telephone. First, in 1880, Alexander Graham Bell successfully made the first wireless phone call from the roof of the Franklin School in Washington, DC. 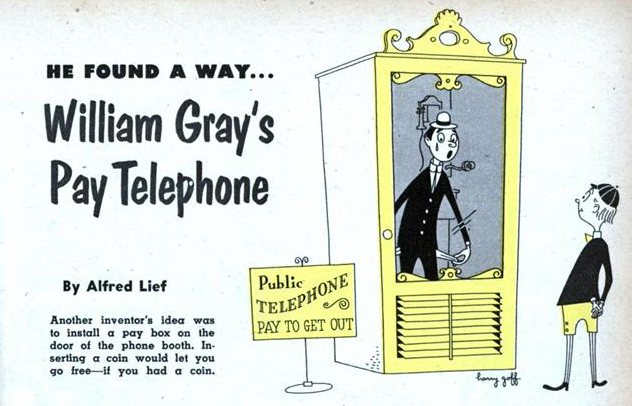 Then, nine years later, the pay phone was invented in New Haven, CT.
That’s right, wireless calling predates the notion of charging for a phone call by nearly a decade, even though the latter would dominate the world of telephony for the better part of the following century. It’s time to wish “Happy Birthday” to another inventor time sometimes seems to have forgotten, although it probably shouldn’t have. 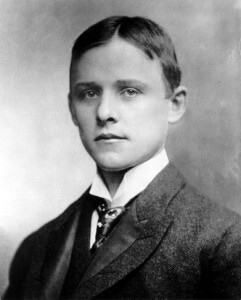 You see, without music professor and serial tinkerer David Edward Hughes, a lot of modern conveniences – tv, radio, telephone, and music recording namely – probably wouldn’t exist. Although he was awarded countless honors in his lifetime, it seems he’s hardly a household name today. Then again, as a man as well-known for his humility for his genius, maybe that’s how he’d have wanted it. Science & innovation are border-blind. That is, great minds come from all corners of the planet, inspired by infinite experiences. Every year, The World Intellectual Property Organization celebrates World IP Day on April 26, commemorating the day it was established in 1970. Organizations all over the world will hold events to celebrate innovation and encourage future generations of great thinkers. 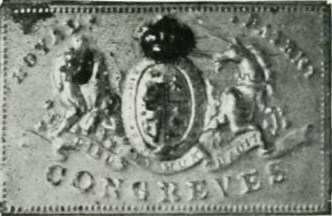 "Congreves," the first successful friction matches ever successfully sold. This week we commemorate the 186th anniversary of the first-ever sale of friction matches. As the story goes, a young Englishman named John Walker had become rather sickened by his surgeon apprenticeship and left the field in 1818 for a less gruesome job as a chemist: something he was apparently (and quite fortunately) good at! Does this man look familiar? He should. 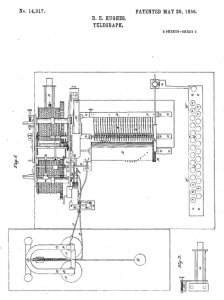 This week we celebrate one of the most important patents ever to cross a USPTO examiner’s desk. The patent describes a process for a producing a material we use nearly everywhere – our homes, our cars, our offices, our hospitals – we even use it in space! It’s one of the most abundant materials on the planet, and it is infinitely recyclable. But, without the work of one brilliant young scientist, its full potential might never had been realized. The fourth week of February is somewhat “lucky” for Rudolf Diesel, the man who’s responsible for a fuel, an engine, and a combustion process bearing his name. And it was this week in history, on February 28, 1892 that Rudolf Diesel received the patent for his groundbreaking compression-ignition engine in Germany. But, as lucky as this week may be this month, maybe it is a little ironic, too, that same week in September happens to be a most terrible one for dear Mister Diesel. You see, on September 29, 1913, Rudolf Diesel disappeared – presumably into the English Channel – never to be seen again.